I’m excited to introduce two young brothers, Hudson and Tucker Meek. I got to know them when they played the bully brothers in Providence. They were incredibly talented, as well as extremely professional on set and just as sweet as can be. They’ve been in Santa Con and The List, and next month they each have a big theatrical release. You can see Tucker in A Walk in the Woods playing the grandson of Robert Redford and Emma Thompson and Hudson in 90 Minutes in Heaven playing the son of Hayden Christensen and Kate Bosworth. Tucker and Hudson pose with me at the Providence set. When did you first discover a love of acting? Tucker – When I was little I liked to repeat commercials that I heard on TV. I went to the SHINE event (for Actors Models and Talent for Christ) in Orlando when I was 7 years old. My favorite showcase was called Product Endorsement. I was missing my front teeth, so I thought it would be funny to do a commercial called the Tooth Loosener. I said “Are you tired of your little brother grinning at you with a mouth full of cash? Then you need the tooth loosener…” and I pulled out a big wrench. Everyone started laughing. I like to make people laugh! I was awarded the Overall Male Child Actor Award. AMTC is where I learned what it meant to “Make Good Bolder”. That’s where I decided that I wanted to be a shining light when I was on set. By the way, I have not tried “The Tooth Loosener” on my brother… yet! How old were you when you got your first acting role? 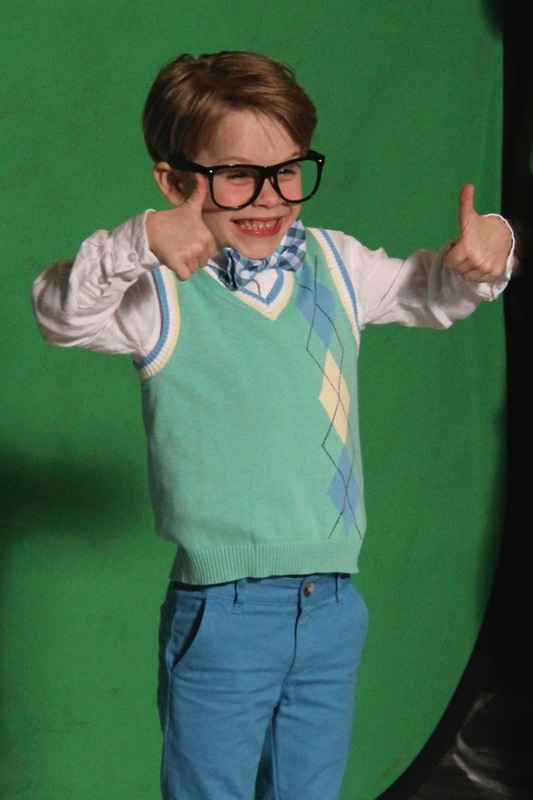 Hudson – When I was 4, I filmed a commercial with a green screen and pretended I was falling out of the sky. I still have the teddy bear that they gave me to carry. His name is Teddy. I filmed my first movie when I was 6. It’s called 90 Minutes in Heaven. Tucker – Right after SHINE, I booked my first faith-based film called Worth Fighting For (with Alan Powell of Anthem Lights, The Song). So, I think I had just turned 7 years old. Tucker, tell us about your role in Santa Con. 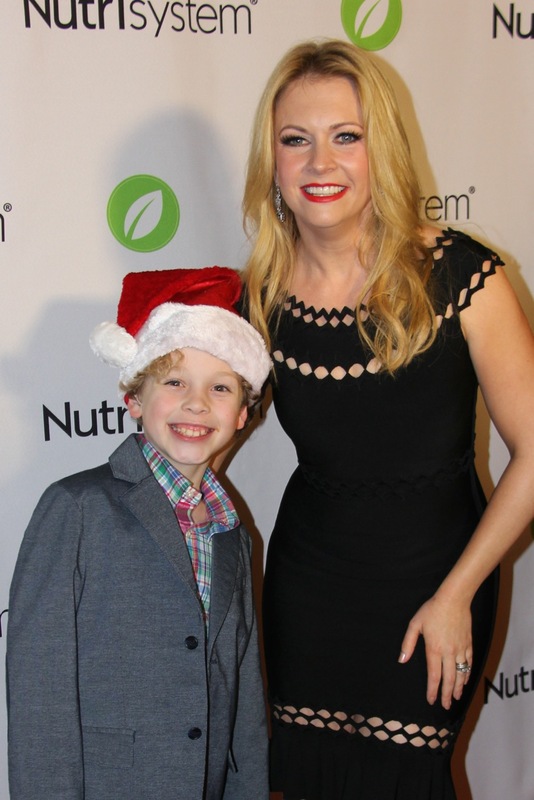 I played a little boy named Billy who asked Santa for his help with a very special wish. In the end, Santa wasn’t the one who helped Billy with his wish. It was an angel. Hudson, tell us about your role in 90 Minutes in Heaven. I play Chris Piper. In the movie, my dad had a bad car accident and got really hurt. I had to pretend to be so so sad when I saw him hurt. The special effects makeup looked very real so it wasn’t hard to pretend. I also thought about how the real Chris Piper felt when he saw his dad for the first time in the hospital. Mr. Hayden (Christiansen) and Mrs. Kate (Bosworth) were very nice. 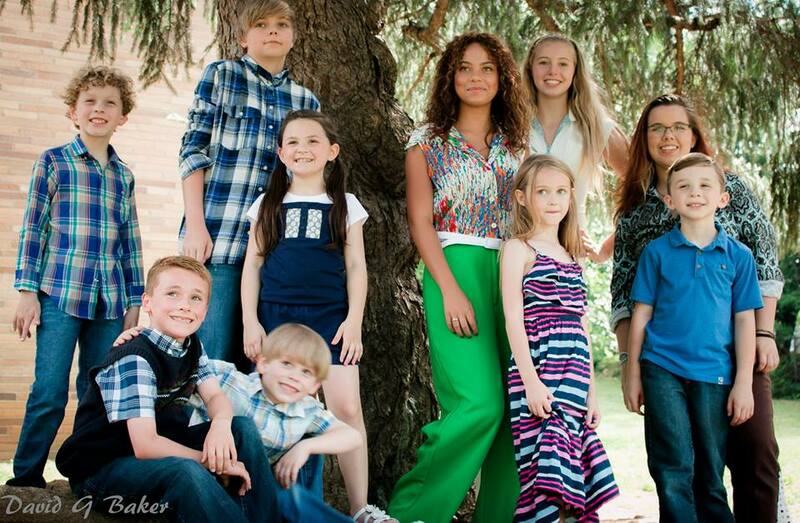 90 Minutes was my first movie, so I didn’t know what it would be like to have a pretend family. But, Mrs. Kate gives a lot of hugs & golden stars. Mr. Hayden taught me all about light sabers because I told him I am a huge fan of Star Wars. The day we wrapped, he gave me one of his action figures with a special note to me on it. It’s very special to me. Mr. Don and Mrs. Eva Piper were also with us on set. I liked sitting with them and talking about stuff when we weren’t filming. I taught them all about mine craft. I also loved face-timeing with the real Chris and asking him questions before my scenes. 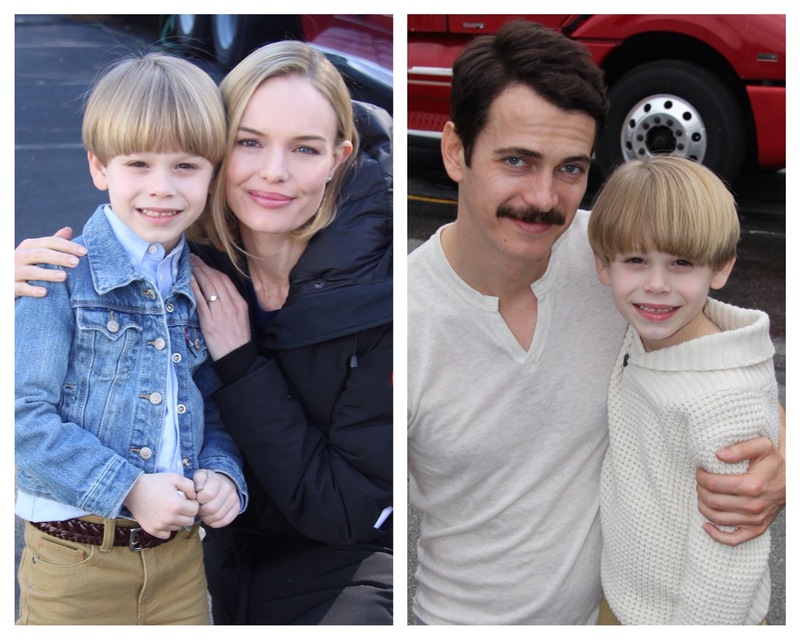 Hudson with Kate Bosworth & Hayden Christiansen on set for 90 Minutes in Heaven. What do you like best about film acting? Tucker – I really like to learn about how things work. It’s cool to see how they film each scene from different angles and then what the movie looks like when it’s edited together. I learned about special effects when I was filming The Santa Con. The movie takes place during December, but we filmed it during the Summer. So it was really hot. But, when you use special effects, you can make it snow in July. How amazing is that? Hudson – I like making new friends everywhere I go. I always say, “Hi my name is Hudson. What’s yours? Do you want to play with me?” And just like that, we’re friends. I like to keep in touch with friends that I made on set. I also really like to pretend. So, when I am acting, I get to do a lot of pretending. Tucker – I would love to be in a futuristic movie about time travel or play a spy-kid who uses telekinesis and Legos to complete his missions. I also love Disney-Pixar movies. So, it would be a lot of fun to be a voice-actor in an animated film. I read that there is going to be a Lego Movie 2… Being in a movie about my favorite toy would be a dream come true! Hudson – Sometimes I pretend that I have super powers. I wish I could be in a movie and have super-speed. My side-kick puppy could have laser eyes. My dad and I think it’s fun to make up bed-time stories about my puppy and our adventures as kid super-spies. I also love to explore outside. I think it would be awesome to be in a movie that films in the jungle and I could play a character who grew up outside like Tarzan! 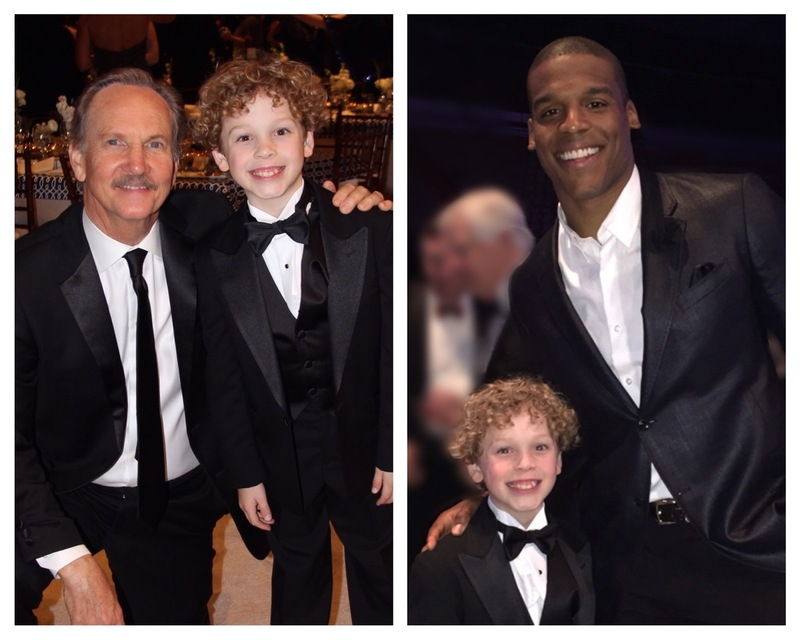 Tucker co-hosting the Because This Is Auburn gala with Michael O’Neill (Transformers, Rectify) and Cam Newton (Carolina Panthers, and Heisman Trophy winner). 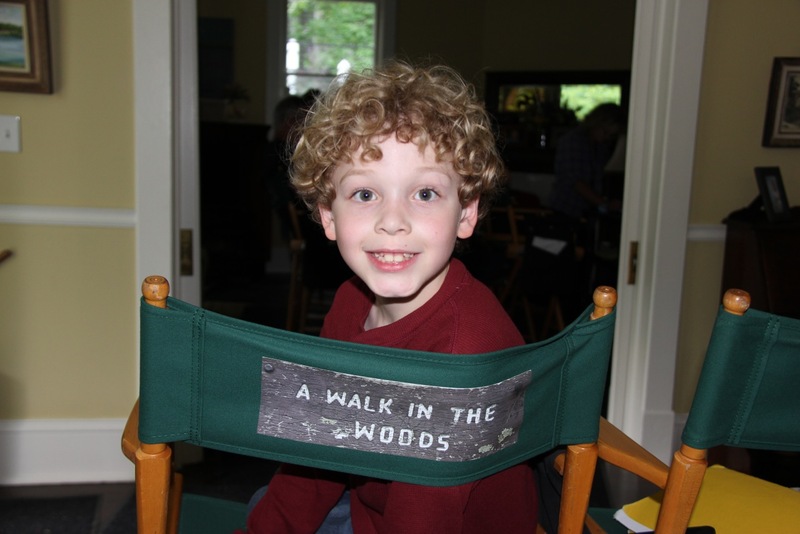 Tucker – On September 2nd, I have a film called A Walk in the Woods opening in theaters. I play the grandson of Mr. Robert Redford and Mrs. Emma Thompson. It was an honor to be able to work with them. I learned a lot from working with both of them. I am a huge Harry Potter fan. So it was fun to talk to Mrs. Thompson about her role in the Potter movies. Worth Fighting For, directed by Joshua Sheik, will be completed this Fall. And Providence will be released early 2016. Hudson – 90 Minutes in Heaven opens in theaters on September 11th. And we can’t wait to see Providence. It’s our first silent movie and the first movie where we get to play brothers. 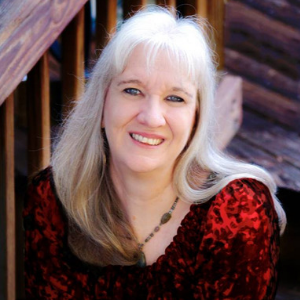 Tucker – I feel lucky to get to work on movies & projects, especially those that teach about God’s love. Even if the movie isn’t a faith-based film, you can still be a shining light for God on set by the way you treat others while you are filming.